Royal Ascot week opened in spectacular style yesterday at the Orangery at Kensington Palace as Classic winner Jet Setting topped the third renewal of Goffs London Sale in association with QIPCO when selling to the China Horse Club for £1.3 million – a dream result for vendors the Equine Growth Partners. Winner of the Irish 1000 Guineas, where she beat subsequent Oaks winner Minding, the Adrian Keatley trained daughter of Fast Company will run in the colours of her new owners in the Group 1 Coronation Stakes on Friday at Royal Ascot. The full results for the London Sale together with details of Royal Ascot entrants are available online here. “It is rare to offer a Classic winner at any sale but to offer one in the middle of the season on the eve of a huge Royal Ascot entry is quite unique. 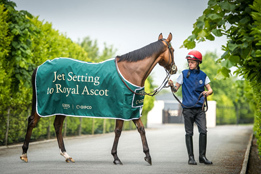 We are delighted to have exceeded the expectations of the owners with a wonderful price of £1.3m for Irish 1000 Guineas winner Jet Setting and we wish her new connections every success in the Coronation Stakes on Friday. There was a vibrant trade, especially for the form horses, and we were also thrilled to be the first auction house in the world to offer a mare in foal to Golden Horn for sale and were very happy with her price. Particularly pleasing this year was the number of new faces among the international buyers present. One of the key objectives of the Goffs London Sale in association with QIPCO is to attract new participants to this great sport, and yesterday we sold horses to first-time buyers from around the world who now go to Royal Ascot as owners and get to experience racing's greatest showcase in the best way possible. The sale enjoyed a wonderful atmosphere despite the very mixed weather but the venue is superb and the set-up was fantastic. I would like to thank our title partner QIPCO who have championed the London Sale from the outset, while our supporting partners Selfridges, Chateau Leoube, VistaJet and Select added so much to the occasion for all involved. In addition I express our gratitude to GBRI for their assistance in the promotion of the London Sale and to the BHA for accommodating the instant change of ownership that allow new connections to see their colours carried at the Royal Meeting.